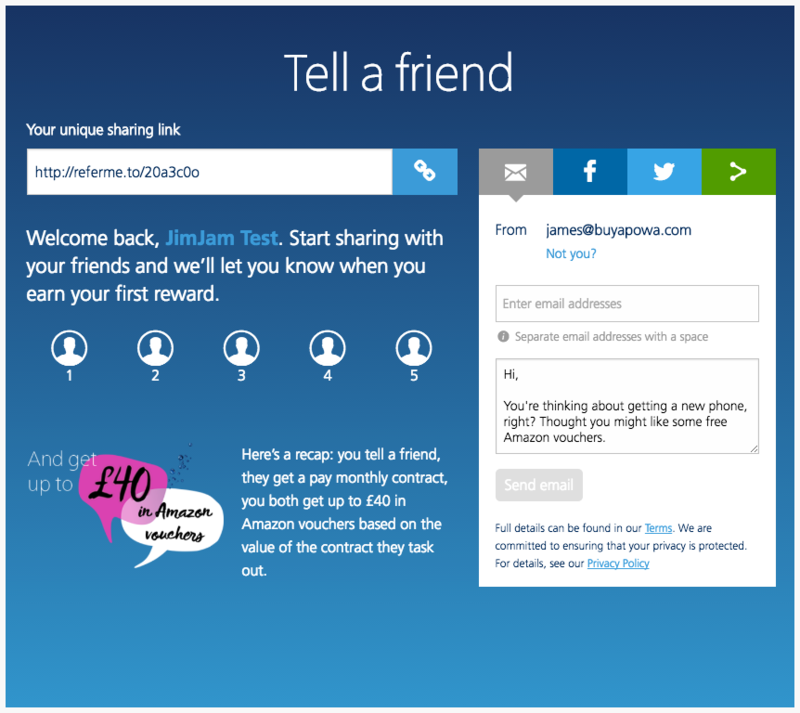 O2 are in the business of helping friends, family and colleagues talk to each other. Which is why it makes perfect sense that, when their customers are happy (and, according to Ofcom, they have the highest customer satisfaction of any UK mobile provider), they should talk to those friends, family and colleagues about the services O2 offers. But referrals, even from happy customers, don’t happen just like that. Customers need to be given the right rewards and incentives to refer friends not just once, but again and again. And referrals need to happen easily, securely and naturally from any touchpoint, whether that be a mobile phone, a tablet or a computer. That’s why O2 has turned to Buyapowa to power the customer referrals for its Pay Monthly products. When an O2 customer inspires a friend to join O2 on a Pay Monthly contract, both they and their friend will each receive up to £40 in Amazon vouchers (depending on the value of the contract). And, to keep customers introducing more and more friends, O2 will be running regular leaderboard contests, rewarding their most successful advocates with exciting, money-can’t-buy prizes. To see O2’s tell a friend programme, just click here.